If you remember the "They'll know we are Christians by our love" verse, this article is for you. Our collection of great Catholic songs will have all you parochial school products, former altar boys, and uniform wearers, humming along. And, really, any lovers of religious music will find it enjoyable. This list is very subjective. In establishing our criteria, we considered many things, and up front, we should clarify a few points. If it’s a seasonal song – like for Advent, Christmas or Easter – it had to be a pretty good one. Kind of like it’s harder for designated hitter in baseball to make the Hall of Fame because DH’s don’t play defense, it was more difficult for seasonal songs to make our list. Having grown up in the 60’s and 70’s, I think it’s fair to say there’s a significant bias to songs that were featured in that era. Still, we tried to include some of the most popular Catholic church songs from more recent years. The origin of many of these great Catholic hymns go way back. Some may not be Catholic in origin, and some might not have not had any religious affiliation, e.g., the tune to “Sons of God” was an old German beer drinking song. Ultimately, it came down to the favorite songs we liked. Hopefully, you’ll like them too. 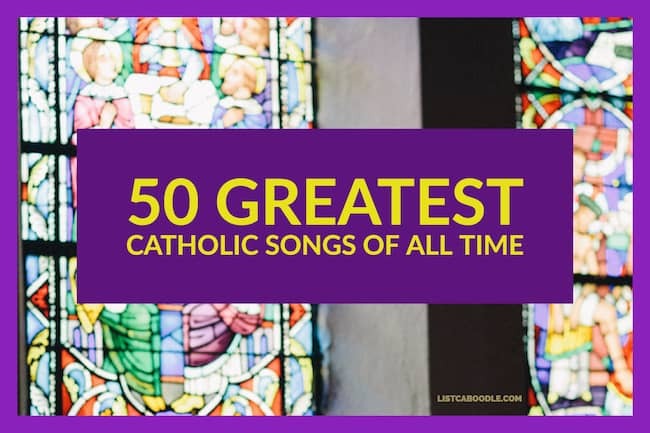 There are lots of Catholic hymns and church songs to choose from, and the list keeps expanding. But, these are the top 50 songs that we think belong in the Hall of Fame. 50) Were You There When They Crucified My Lord? This song was likely written by African-American slaves in the 1800s. Records show it was first printed in 1899. Written by John Foley based on many Psalms. Church music at its best. Many of these great Catholic songs are in the singer-songwriter genre. Check out some of the best singer songwriter performers on the pop charts in the 1970s. Written by Sister Suzanne Toolan, this Communion song almost never came to be. It was 1966 and Mercy Sr. Suzanne Toolan had been asked to write a song for an event in the San Francisco archdiocese. With the deadline looming, she worked on a song in an unoccupied room next to the infirmary in the Catholic girls’ high school where she taught. That schoolgirl saved “I Am the Bread of Life,” one of the most popular hymns of the Second Vatican Council era. Prolific Dan Schutte also wrote this well-loved song. Written in 1981, the lyrics are based on Isaiah 6:8 and 1 Samuel 3. The song has been used in Papal masses. Another Dan Schutte song that’s easy to sing. Though the mountains may fall and the hills turn to dust, yet the love of the Lord will stand as a shelter to all who will call on his name. “Sister Smile”, in French “Soeur Sourire,” was a Belgian singer and songwriter who was in the Dominican Order. Born Jeanne-Paule Marie “Jeannine” Deckers, she achieved worldwide fame when “Dominque” landed in the Billboard Hot 100. Debbie Reyolds played her in a feature movie. Composed by Franz Xaver Gruber in 1818, the version sung by Bing Crosby is the third best selling single of all time. Father Joseph Mohr, a young priest, wrote the lyrics. This guy is like the Michael Jordan of Catholic hymns – yes, Dan Schutte again. If it’s Easter and you’re at a Catholic Church, the odds are 99.8% that you’ll hear this one. Written in the 14th century, this one goes way back. It was originally a Bohemian Latin hymn. A famous Christmas carol with lyrics by James Chadwick, Bishop of Hexham and Newcastle. The music come from Les Anges Dans Nos Campagnes, a French song. Sister Miriam Therese Winter wrote “Joy is Like the Rain” at the lowest point of her existence knowing just three chords on the guitar. You might like our Fun Facts about the Top 25 Motown Songs. Appears to be translated from an old German hymn. Once offered on the rood. Dating back to 1865, this song is an old African-American spiritual that’s considered a Christmas Carol. From the Medical Mission Sisters “Joy is Like the rain” album which was released in 1966. Melody by Charles Gounod superimposed on Bach’s Prelude in C.
In the 1970s, the “Guitar Mass” was a thing. If you were present, there was a good chance this song would be played. Who better than Woopi in “Sister Act” to bring this one to life? Christmas mass isn’t over until this one gets played. Yet another great Catholic church song featuring Mary. Another one of the great Catholic hymns by the Medical Mission Sisters written by Miriam Therese. Blowing to greatness the trees on the hill. And blow where you will. But the breath of the Spirit blowing in me. This one kind of had a haunting melody that was difficult to shake. Something about that “They’ll know we are Christians” line. Written by Jesuit priest Bob Dufford. And you shall speak your words in foreign lands and all will understand. The Catholics go-to song for funerals, it generates a Pavlov response for many to ask for a tissue. But, it’s played in ordinary times at regular masses as well. With a tune borrowed from the American Shaker song “Simple Gifts,” Sydney Carter wrote this song in 1963. There you have it – some of the great Catholic hymns of all time. Agree? Disagree? Suggestions? Let us know. You may also enjoy the 31 song lyrics that changed the way we talk.